Are you using the coupons & deals method to promote affiliate products & services? Are you searching for a premium wordpress plugin to post coupons & deals on your WordPress site with a innovative look? If yes then all you need is WP Coupons plugin as it is the only premium wordpress coupon plugin which enables you to boost your affiliate sales by 200%. lets see how it is possible..
Thousands of Affiliate marketers and bloggers use the “coupons & deal” method to earn money via affiliate programs. we all know, everyone loves discount and promos and hence since a year almost all serious internet marketers who are promoting affiliate products are displaying coupons, deals and promo codes to grab more sales and visitor attention. WP Coupons Review : Premium Coupon plugin built for Affiliate marketers. Let me introduce WP Coupons. This is a premium wordpress plugin is developed by affiliate marketers for affiliate marketers to help increase CTR and conversion. As this is a wordpress plugin, it enables you to add very attractive looking coupon button , coupon widgets and deal page in your wordpress post, sidebar or at any place using short code. WP Coupons also crates a new deal page with all coupons displayed in grid layout. So when you install WP coupons you will get a new coupon page like https://bloggingeclipse.com/deals/. You may also choose any other slug to craft your exclusive deal page where all the coupons created by this plugin will be displayed in a very creative manner. You can simply add a lot of coupons with affiliate links and all it will be displayed in the deal page. You may also add those selected coupons to each post by using short code. Lets see some of super exciting key features of WP Coupons and how this premium coupon plugin can increase your affiliate sales. WP coupons is certainly not among those memory hungry plugins which consumes lot of CPU resources. In-fact WP Coupons is very light weight plugin, it is only just 36 KB zip size. Also you do not need to read extensive documentation as it is just one click install and you can customize is global options easily from its settings page. you can adjust fonts, colors opf coupons according to your blog style. By default WP Coupons comes with very attractive color combination settings and font, However if you want to customize the look of coupons, you can change color, fonts and even add custom CSS or design templates. Apart form creating a deal page, WP coupons enables you to display a coupon with detailed information like coupon code, title, image, description and affiliate link button in your posts or pages using short code. The plugin also have its widget which enables random coupon display in sidebar widget. You can also show preferred coupon on homepage sidebar. 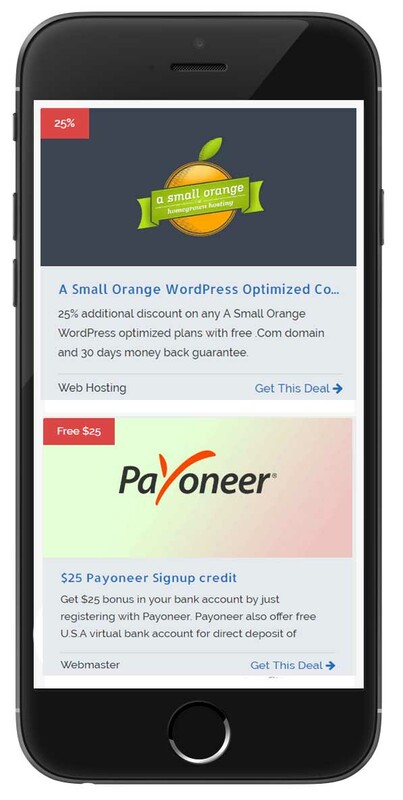 These days everyone is browsing internet via Smartphone or tablet and hence WP coupons is totally responsive, It is compatible with any screen size and looks more eye catching on smartphones. though the plugin is light weight, easy to install and does not require any type of support but still if you need any help regarding installation or customization of WP Coupons, their support team offer direct support from developers of the plugin. They have also created in-depth documentation with solution to almost all questions related to this plugin. Wp Coupons Docs can be accessed form your members panel. Here is the live example of How a Coupon box looks in post, You can change colors & fonts. The premium plugin comes under very cost effective pricing. One can grab it in $34.95 (with additional discount) for one website. All the plan comes with 1 Year of Updates & Support and 30 days money back guarantee. WP Coupons does not have recurring pricing , Just you have to pay one time charges and you can use WP Coupons on a site for unlimited period of time. However the support is given for a year. So to continue receiving support & updates after one year you have to renew the licence which is not at all mandatory. WP Coupons is running a special promo right now in which you can get additional 25% discount on all the plans. So click on the button below & use coupon “WOORKUP“ at the time of checkout. Do you really need a Coupon plugin? Do you know maximum of the affiliates sales are generated using coupons & deals post. Everyone on the internet us hunting for discounts and coupons of a particular product or service to save money on its purchase, and hence it is very wise idea to promote products via sharing deals & coupons of it. There are lots of free & premium wordpress themes and coupons plugin scattered over the web but if you do not want to launch a new site and want to add coupons & deals section on your existing wordpress blog then WP Coupons is only plugin which can do it. Most of the bloggers writes product reviews, in-depth comparison, how-to guides and tutorials to promote affiliate products. If you add a good looking coupon or deal button of a product on its review post then a lot of users will click on it to redeem discount or promo. This boosts affiliate sales as compared to normal review post. Even you can start a brand new coupon website using WP coupons as this premium plugins allows you to display all coupons on single page which you can set as your home page also. So if you doing affiliate marketing in a particular niche, you can start its coupon website or section on your sub domain by using WP Coupons. I installed this plugin on BloggingEclipse , You can check its live demo on my site here, or its official demo here. In my affiliate marketing journey of 4 years,my 70% of monthly affiliate marketing income is from Coupons & deals. So you can assume how significant impact :Coupon: makes on your post. It is always better to display coupons& deals o n your post to grab more sales on the products you are prompting. if you are still not displaying Coupons & deals on your posts, try it today & you will thank me later. WP Coupons is only WordPress premium coupon plugin with so much exciting features and complete coupon management without installing any extra coupon theme. This was honest review of WP coupons with my personal experience. I would love to hear from you about experience in affiliate marketing using coupons & deals in comment section below. See you in the next post, till than Happy Monetizing!